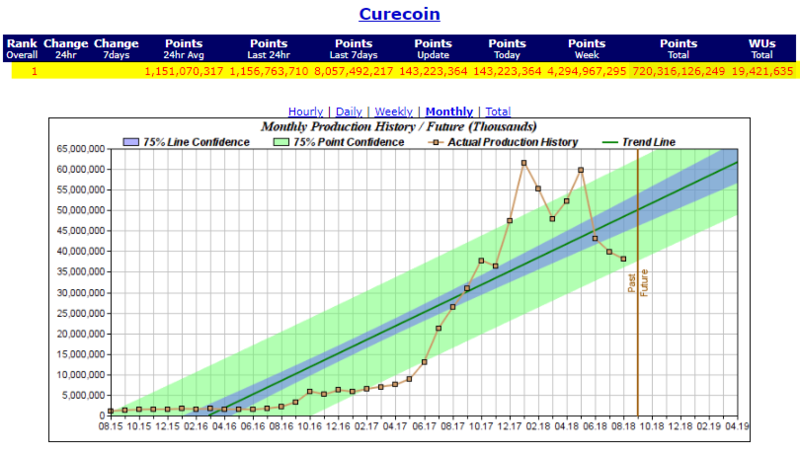 “What makes Curecoin a challenge to explain to colleagues, friends & family? “What makes Curecoin a challenge to explain to colleagues, friends and family? Folding vs Mining vs PoS? Our business model focuses on Social Entrepreneurship – helping accelerate research that was once only in the realm of voluntary activity (supporting [email protected]). We created a Secure Tokenized Incentive with the goal of linking vendors (including our own company store) with our Rewarded Giving model. Thanks to the participation of people like you, the Curecoin Team (in collaboration with Foldingcoin via Merge-Folding) is the most powerful Distributed Computing Team in the world, on the most powerful supercomputing network in the world – Stanford’s [email protected]! So why not just pay for supercomputer time? Why all the layers of PC’s in Distributed Computing Networks, blockchains, folding clubs, etc.? What are these computations actually worth? This has been a long standing question that we will try to answer as simplistically as possible. What makes funding difficult comes from the fact that protein folding research is still somewhat exploratory (That said, thanks to AI and Deep Learning, scientists are uncovering new ways to predict protein behaviours). Even though protein molecules are simulated on computers, they do require a certain level of “brute force” computation to explore their permutations (or intermediate states). This level of detail would be nearly impossible to produce via physical experimental methods alone. The extensive exploration required, and sometimes uncertain outcomes part of the “protein folding problem” appear to be difficult to fund when NIH funding is still below 2003 levels when adjusted for inflation, and grants have become increasingly politicized. It’s a wonder why computational biology (like [email protected]) via citizen science remains underappreciated as a global phenomenon. We can look at the break-even costs, not the value of the discoveries themselves. At its peak in 2016, the [email protected] network produced 50,000 “Native” TeraFLOPS worth of computations per day. The Curecoin team, with FoldingCoin’s help via merge-folding, have produced over 50% of those computational cycles. This is the equivalent of one and a half $97 million IBM Titan supercomputers running nominally at 17,590 TeraFLOPS each (total of ~25,000 TeraFLOPS), using 8.2 MW of power each (total power consumption of 12.3 MW). 3. Using the same criteria, the Curecoin/FoldingCoin team collaboration would cost the following using [email protected]’s distributed computing model. … since the vast majority of computational power on our network is directed towards protein folding research (Coins are reserved for protein folders and automatically paid out via a dedicated “folding pool” Cryptobullionpools). Less than 20% of the power is needed to secure the network via a combined Proof-of-Stake (PoS) and traditional Proof-of-Work (PoW) mining (with near-term plans to migrate to a Certificate-based pure Proof-ofStake (PoS) system to eliminate the need for all ASIC mining). 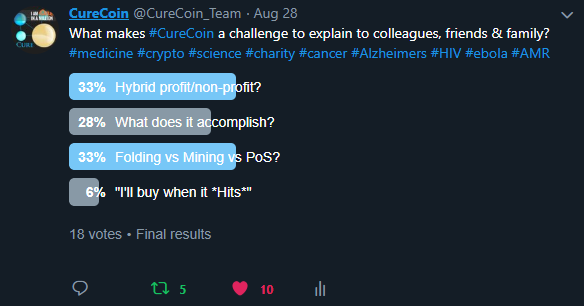 Unlike bitcoin, where increased mining competition merely over-secures the network – increased competition among Curecoin network participants actually makes each “token” represent MORE research !!! This is something the markets have yet to discover. 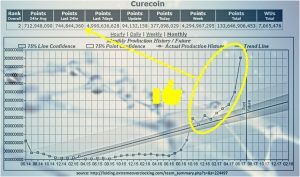 Buying Curecoins actually increases competition and thus research contributions to cancer, Alzheimer’s, Huntington’s, Parkinson’s, various Infectious diseases, and even Artificial Intelligence, Deep Learning and Cloud computing research relating to computational biology. 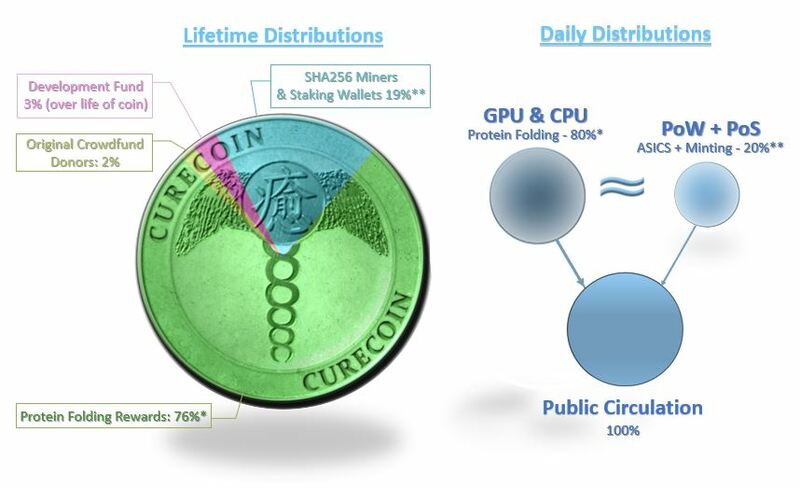 Unlike most crypto-currencies, Curecoin doesn’t require any special equipment to mine (esp. via protein folding). Even a ten year old laptop PC or Apple Mac can contribute to research, and qualify to win prizes via our Folding Club. Curecoins can be viewed through the lens of Carbon Offsets for Bitcoin mining. Please don’t hesitate to connect with us on Discord, Reddit, Facebook and Twitter, Charity Twitter … or email me your questions (contact link above). The first half of 2017 has proven to be an exciting time for Curecoin and our merge-folding partners at FoldingCoin. We’ve had an exponential increase in the number of computations the team produces. Thanks to a combination of growing interest in protein folding research, along with several bombshells in the cryptocurrency markets has made our team the most powerful distributed computing team in history. Recent levels of interest in merge-folding put Curecoin’s team 224497 on a trajectory to overtake the number one spot on [email protected] in early September. This is great news for the research of cancer, neuro-cognitive disorders and infectious diseases! Today, the Curecoin Team’s combined computational output is 29 PetaFLOPS* (about 39% of the [email protected] network). 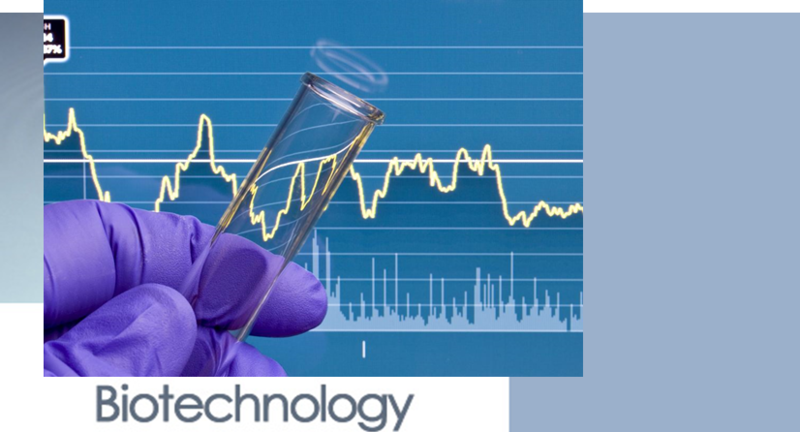 This means the team produces molecular research at rates comparable to some multi-million dollar supercomputers ! The Curecoin team has shipped a new, more secure wallet version 1.9.2.1, with more changes in the pipeline for 1.9.4.x to make the current version of Curecoin an even better user experience. In addition, the Curecoin Team has added several new team members, including EvergreenCoin’s founder and developer – Steven Saxton. We are transitioning to an Agile unified process keyed to our wallet builds. Curecoin has created a separate, 501c3 sponsored Curecoin Project, whose to-date contributions to scientific, medical and social organizations has surpassed $17,000 USD. We have the ability to accept donations via Paypal, direct USD, and Amazon Smile donations. Currently we have over 15,000 tokens listed on exchanges destined for conversion to charitable giving. Curecoin 2.0 will soon be soliciting applicants for a broader internal beta test. We’d like to start receiving feedback from individuals with targeted skills in the QA process. There will be some changes coming to the plan-of-record regarding a standalone version of SigmaX and integration of Proof-of-Proof – so please stay tuned to our bitcointalk ANN thread. It’s been 5 months since CureCoin launched to the public, and we’ve just reached #5 in the all-time points standings for [email protected] Okay, so there were a few points from early testers so we’re sort of fudging the “5 months” a little – but let us have our moment. It’s been a great run, but even more exciting is that this represents only the beginning for CureCoin. Don’t take my word for it, though – let’s look at some data about our Folding Exploits. 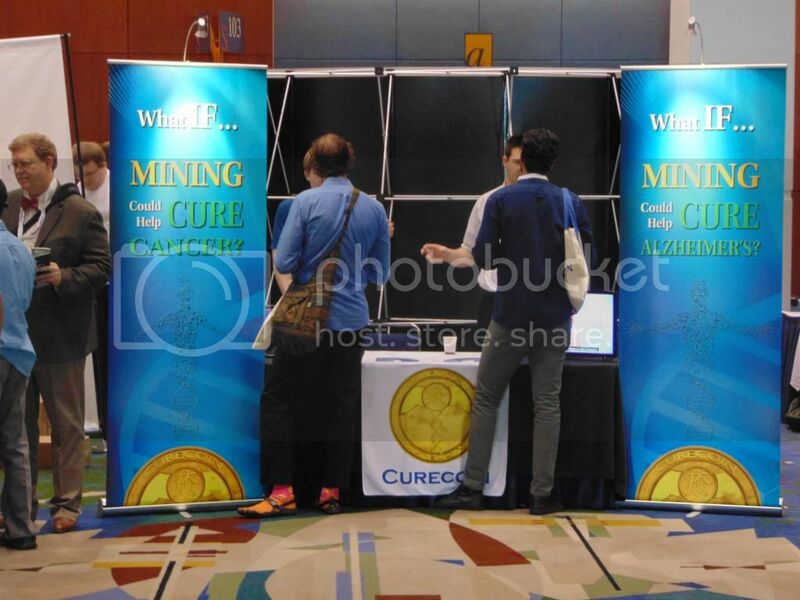 The first day at The North American Bitcoin Conference in Chicago was great for CureCoin. The convention floor was very busy, and the team met a lot of interested folks. Many a business card was exchanged! Some folks seemed to think CureCoin was a donation system instead of an Alternate CryptoCurrency altogether. When it was explained, however, we found that everyone was very responsive to the idea of a POW system based on valuable computations. We couldn’t be happier to see the enthusiastic response so far – and there’s a whole day to go. One of the more common themes was “where are we now, and where are we headed?” Let’s take the moment to explore this, since it was a primary topic. CureCoin is here in beautiful Chicago for The North American Bitcoin Conference! Come by the CureCoin table in the exhibitor’s area to meet our Developers learn more about CureCoin. The submissions were arrayed, the votes tallied, and the results were – more troublesome than expected. The Logo Contest was started by some motivated community members who weren’t happy with the current logo. The Dev Team didn’t have a problem with the current logo, but in the spirit of community the logo contest was allowed to grow. One dev even contributed the lion’s share of the reward, and we hosted the poll on the website. Still, this was a community effort, community funded and driven. The results were not meant to be binding. CureCoin has been making waves in the media as a fresh new entrant on the CryptoCurrency scene.